Schlossplatz, Stuttgart, on a beautiful spring day. The Stuttgart region loves its festivals, but when it comes to frequency and diversity, there’s no time quite like the summer. 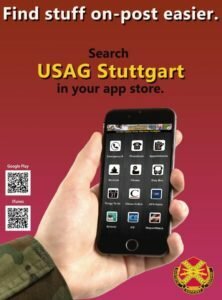 Most local towns and villages will have their own events, including each neighborhood of Stuttgart. From music festivals to food and world culture, the options are endless. This article provides some highlights of festivals and similar events in July, but keep your eyes peeled for the many more that are out there. All events detailed are free to enter unless otherwise noted. It’s a good idea to bring enough cash to cover intended purchases at food and drink vendors or market stalls, as credit cards will most likely not be accepted. Additionally, cities and event organizers always encourage using public transit due to busy streets and limited nearby parking. General directions to each festival are included, but apps such as VVS Mobil, SSB Move, and DB Navigator offer customized door-to-door public transit routing and the ability to buy tickets on your mobile device. Most event websites will only be offered in German; using a service like Google Translate will help to make most things roughly understandable. While many activities will, of course, also be in German, don’t feel intimidated—dancing, music, fireworks, and food transcend languages. Get out and have fun! Esslingen’s town hall (right) towers over Rathausplatz. 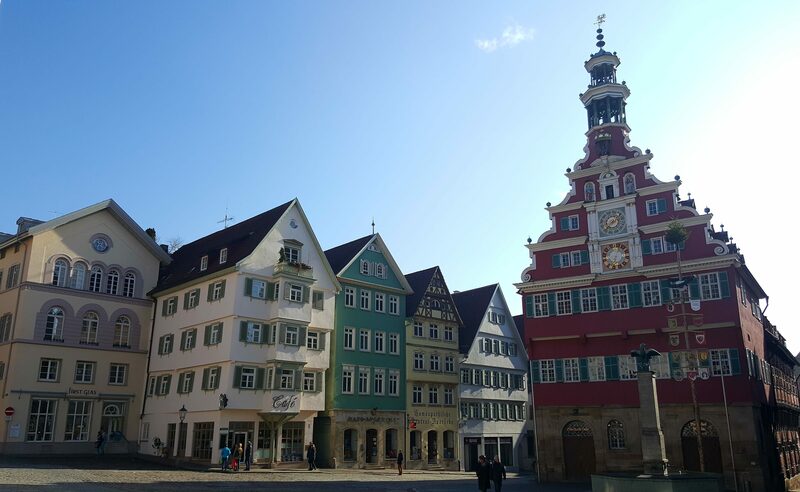 Located along the banks of the Neckar River, the beautiful and historic city of Esslingen celebrates its citizens (not hamburgers; note the umlauted “u”) in an annual three-day festival dating back to 1973. Multiple stages throughout the city center host concerts, performances, and other entertainment, with some activities especially for children. Vendors will be on hand to offer culinary specialties, and shoppers can rummage through flea markets. Sunday morning is highlighted by a race, the Esslinger-Zeitung-Lauf, which attracts runners from far and wide. 🚇 How to get there: Take the S-Bahn line S1 to Esslingen (Neckar), a roughly 40 minute ride from Böblingen or Goldberg stations near Panzer Kaserne. Regional trains are an additional option from Bad Cannstatt, the closest S-Bahn station to Robinson Barracks, and take eight minutes to arrive in Esslingen with no intermediate stops. The annual Africa Festival celebrates African cultures with food, fashion shows, concerts, and more. The festival’s central location is a great place to enjoy the live music and dancing, African bazaar, and dishes from local restaurants. For a schedule of activities and concerts, visit www.afrikafestival-stuttgart.de. 🚇 How to get there: Erwin-Schöttle-Platz is served directly by U-Bahn lines U1, U9, and U34, and Bus 42. From Panzer Kaserne or Kelley Barracks, take the S-Bahn or U-Bahn to Vaihingen and change to line U1. One summer highlight of the baroque palace at Ludwigsburg is the Grand Musical Fireworks Display on the evening of July 7, when the gardens are filled with thousands of lights and the sounds of classical music. A 20-minute firework display, synchronized to the music, rounds out the night. The free Royal Children’s Festival, now in its tenth year, will take place in the central courtyard of the palace on July 8 (1-6 p.m.), with a number of activities including a royal throne on which children can take pictures. Sand Artists will also be sculpting their art during this time, and their completed works will continue to be exhibited until August 30. 🚇 How to get there: Ludwigsburg train station is served by S-Bahn lines S4 and S5 as well as regional trains from Stuttgart Hauptbahnhof. The palace can be reached on foot from the station in approximately 15-20 minutes; many buses have stops nearby and travel from the station to the palace in a matter of minutes. It doesn’t take long for new residents to realize that landlocked Stuttgart isn’t exactly renowned for its seafood. For ten days each July, vendors from Hamburg’s famous fish market hit the road and set up in Stuttgart’s Karlsplatz to help fill the void. Enjoy live music, drinks, and food until 11pm (Sunday through Wednesday) or midnight (Thursday through Saturday). 🚇 How to get there: Karlsplatz is adjacent to the Old Palace (Altes Schloss) in downtown Stuttgart and a 10-15 minute walk from the S-Bahn or U-Bahn at Stadmitte or Hauptbahnhof. Charlottenplatz, a transfer hub for the U-Bahn, is the most convenient public transit option. Lenny Kravitz, Jamie Cullum, Gregory Porter and other international musicians headline the 25th annual Jazz Open Stuttgart. Tickets (€20-€95) are required to enter the concert area and see the performers; however during open-air performances in the courtyard of the New Palace (Neues Schloss), the music can be heard from around Schlossplatz. Information on concerts and tickets is available at jazzopen.com. For a free alternative, the new City Museum of Stuttgart at the Stadtpalais will host open concerts at 10pm on July 13-14 and 16-21. 🚇 How to get there: Venues vary. Most concerts are held in downtown Stuttgart, with some in Ludwigsburg. Schorndorf is a charming village east of Stuttgart known primarily for being the birthplace of automobile pioneer Gottlieb Daimler. It’s also home to a summer street festival with food, drinks, and outdoor entertainment nestled between the half-timbered frames of Old Town. Event map and information at schowo.de. 🚇 How to get there: Schorndorf station is served by S-Bahn line S2 and is situated next to the Old Town. Travel time on the S-Bahn from Goldberg is approximately one hour and ten minutes, including a transfer from line S1 to S2. 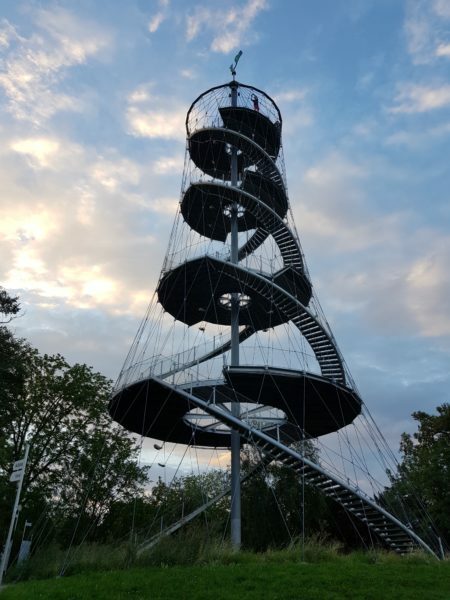 The deceptively tall, free-standing tower at Killesberg Park offers stunning views of the Stuttgart region. The first “night of lights” at Killesberg was held over seventy years ago and has only been perfected since. Live music, children’s games, and rides on the park’s mini-railway are among the activities leading up to the musical fireworks which conclude the evening. While food and drink vendors will be available, visitors can also bring their own food and non-alcoholic beverages “in quantities that are normal for consumption” (but don’t bring glass). Tickets (€12-16) and more information available at lichterfest-stuttgart.de. 🚇 How to get there: Lines U5 and U7 serve the Killesberg U-bahn station along with buses 43, 44, and 50. With over 40% of its residents coming from a foreign background, Stuttgart is one of the most diverse cities in Germany. The Summer Festival of Cultures celebrates this with six days of world music, food, shopping, and other activities in what is the largest intercultural festival in Southern Germany. More information, including concert schedules, at sommerfestival-der-kulturen.de. 🚇 How to get there: Marktplatz is in the heart of the city center, an approximate ten minute walk from the Stadtmitte S-Bahn station. U-bahn stops Rathaus and Charlottenplatz are closest, with Schlossplatz and Rotebühlplatz Stadmitte also nearby options. “Feast on the lake” with almost two dozen food and drink vendors and a full lineup of concerts around the lakes of the city center. A meetup of “Old Timer” cars is scheduled for Saturday and Sunday. For information including menus, concert schedules, and maps, visit schlemmenamsee.de. 🚇 How to get there: Böblingen station is served by S-Bahn lines S1 and S60, along with numerous buses. The festivities take place less than a ten minute walk down “Bahnhofstrasse” from the station. The Heusteigviertelfest from June 29-July 1 kicked off the season of neighborhood street festivals in Stuttgart. The “bean quarter,” so named because of the many vining pole beans grown by generations of residents, is one of the oldest areas of Stuttgart. Covering the area between Charlottenplatz and Leonhardsplatz, it remains well-preserved and is home to many restaurants, cafes, and artisan shops. Its festival is traditionally held on the last weekend in July before the summer holidays of local schools and features food and drink as well as concerts, dance, and sports demonstrations. 🚇 How to get there: U-Bahn stops Charlottenplatz, Olgaeck, and Rathaus all border the district. The trendy area around Marienplatz becomes even more of an activity hub during the Marienplatzfest. Indie, folk, and electro pop musicians are scheduled to perform, with urban art, DJs, children’s programs, and food and drink set to complete the occasion. 🚇 How to get there: Marienplatz is on U-Bahn lines U1, U9, and U34 and bus lines 41 and 43. From Degerloch, you can also take the Zacke (inclined railway) for a panoramic view of the city included in the price of a normal transit ticket. Ballet in the Park is one of the most anticipated open-air summer events, when Stuttgart’s world-renowned ballet transmits a live performance onto a giant screen set up in the lawn opposite the opera house. Saturday features a selection of pieces by members of talented academies while Sunday offers the professional company. The Stuttgart Opera offers a live screening of Bellini’s “The Puritans” on Tuesday night in the same space. Visitors must bring their own blankets or small, soft seating. Glasses and cans are not permitted. 🚇 How to get there: Use Schlossplatz U-Bahn stop or the “Königstrasse” exit from Stuttgart Hauptbahnhof from the S-Bahn, U-Bahn, or regional trains. 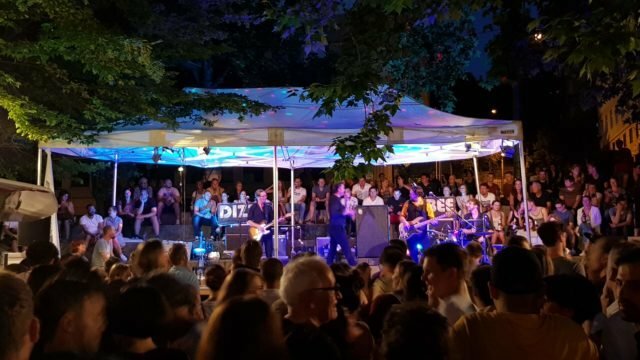 The name of the “Hangman’s Fest” harks back to the time Wilhelmsplatz served as the city’s execution site in the Middle Ages, but it’s the festival that offers a killer experience these days. The four-day event, which includes diverse selections of live music, food, and drinks, attracts thousands of visitors annually. 🚇 How to get there: Wilhelmsplatz is a five minute walk from Österreichischer Platz or Rathaus U-Bahn stops. It is approximately 15-20 minutes walking from Stadmitte S-Bahn/U-Bahn station. Festivals such as a Weindorf, or “Wine Village,” offer a relaxing atmosphere in historic surroundings. 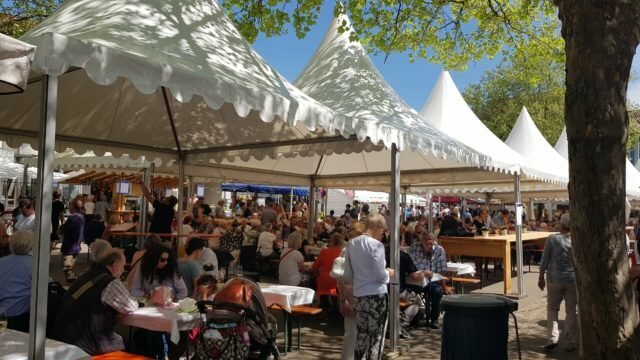 Founded as Stuttgart’s first street fest, the Wine and Pretzel Festival in Bad Cannstatt’s old town offers salty pretzels, sweet wines, and every taste in between. Those who would rather pair pretzels with beer will have a number of options available, as well as other foods. Musical entertainment is also on offer. 🚇 How to get there: The Bad Cannstatt Market Square is a few minutes’ walk from Bad Cannstatt train station (S1, S2, S3, and regional trains) and Bad Cannstatt Wilhelsplatz U-Bahn stop (U1, U2, U13, U19). Rosensteinbrücke U-Bahn stop, served by the U14, is a short stroll across the river.